The “worse than we thought” crowd has got things backwards. The state of the climate is better than they told us. 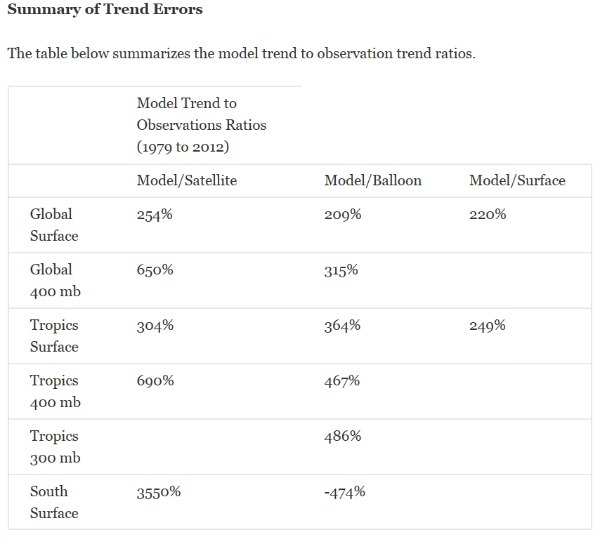 In stark contrast, the state of climate modeling is worse than even many of us skeptics thought! John Christy of the University of Alabama in Huntsville (UAH) examined 73 IPCC climate model runs available as of June 1, 2013. 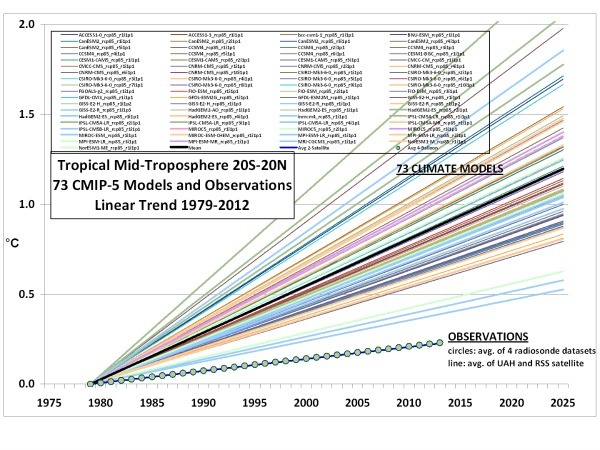 He found that all overshoot the warming of the tropical mid-troposphere during the previous 34 years as measured by two independent satellite datasets and four independent balloon datasets. As the above chart shows, although all models fail to replicate reality, some do much worse than others. 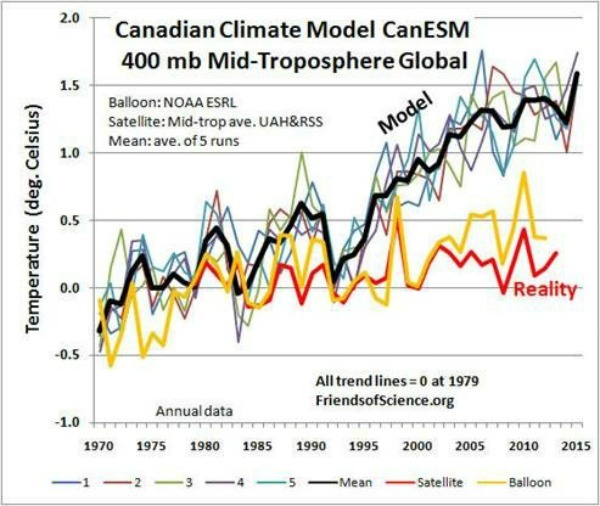 This week on WattsUpWithThat.Com, engineer Ken Gregory has a guest essay on the Canadian Climate model’s “epic failure.” For the 34-year satellite record (1979-2012), Gregory compares the Canadian model’s temperature projections to observations in several atmospheric layers and geographic areas. For example, in the global mid-troposphere, the model on average overshoots observed temperatures by 650%. Why should we in the U.S. care about this? In 2000, the U.S. Global Climate Change Research Program picked the Canadian model as one of two models to serve as the basis of its first National Assessment report on U.S. climate variability and change. The USGCRP did so even after Patrick Michaels and Chip Knappenberger demonstrated that the model replicated past U.S. temperature trends worse than a table of random numbers. We are living with the consequences today. Petitioners in the case that became Massachusetts v. EPA repeatedly cited a Bush administration report that summarized the National Assessment’s overheated climate change projections. Your tax dollars at work!